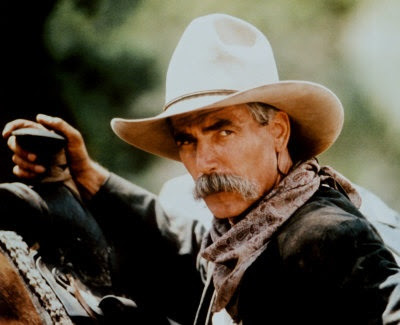 Pro Libertate: "It's The Money"
Rancher Seaborn Tay (after several of his employees became rustlers): "What do you reckon it is that makes a man go to hell like that?" Faithful Ranch Hand: "It's the money, Mr. Tay." Conn Conhager (disgustedly): "The money.... God help us if that's all it is." What is it that turns a man into a specimen like Acting United States Attorney Edward R. Ryan, whose name is inscribed on the tissue of lies and totalitarian assertions called a "Bill of Indictment" against four key figures in NORFED, aka the Liberty Dollar organization? To at least some extent, it must be the money (or at least the officially sanctioned similacrum of the same) that provides for Ryan's material comforts and subsidizes whatever squalid vices he enjoys. Since Ryan is a servant of the kleptocracy we can assume that vice, of some kind, plays a significant role in his discretionary time: Someone who steals for a living isn't likely to be a moral paragon when he's off the clock. As a tax-feeder, Ryan, like the rest of us, is paid in the innately worthless scrip and slugs that the Regime insists on calling "money." The chief difference is that he, like others in the Regime's employ, gets first, best use of the currency at the beginning of the debasement cycle; he enjoys a slew of benefits that are funded by the labors of the honest and productive; and he -- unlike those in the productive sector -- can reasonably expect that his salary will more than keep pace with inflation. For the Regime and its clients, and those who serve that system, inflation is as beneficial as it is baneful for those of us trying to make an honest living. Ryan really should be shunned by those who know him as if he were the carrier of a lethal disease, and the epicenter of an unbearable stench, two traits immediately recognizable to people with a rudimentary sense of right and wrong. Long ago, acting on motives known only to himself and his Creator, Ryan sold his soul at a steep discount by taking a job in the employ of the world's deadliest, most powerful criminal syndicate. Now, bearing the august title of U.S. attorney, Ryan is protecting criminals whose deeds impoverish and threaten all of us, by prosecuting innocent people whose acts of legitimate commerce threaten nobody but those very same apex-level criminals. Pish, who'd want one of these? A gorgeous, lustrous Liberty Dollar -- one solid ounce of .999 fine silver. Until late 2007, when the Feds invaded its offices and stole the company's assets, the Liberty Dollar organization marketed platinum, gold, silver, and copper coins, and issued colorful, finely wrought warehouse receipts that were redeemable in specific amounts of precious metals. The Liberty Dollar was a private currency of the type that was very common in the United States prior to the bankster coup de main that left us with a centralized, politically controlled fiat pseudo-currency. It was offered and accepted on a purely volunteer basis, with fully informed people on both sides of the transaction. 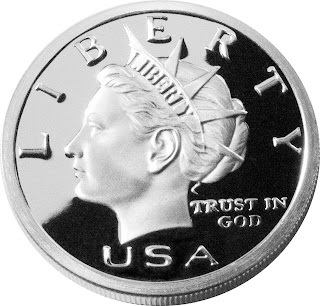 One could take issue with the premium charged by the company for its coins, or dispute the strategic wisdom of its campaign, but it is impossible for honest, rational people to perceive a criminal conspiracy in which people were bartering for goods and services using the only substances recognized by the Constitution (Article I, section 10) as a legal currency -- gold and silver. According to Edward Ryan and the people who fill his trough and determine the length of his leash, it is a crime to seek the overthrow of the Federal Reserve System by the peaceful, cooperative methods employed by Nothaus and his associates. Query: Is it likewise a crime to seek the overthrow of that system through legislative means -- say, through an audit of the sort pursued by Rep. Ron Paul and a growing number of his congressional colleagues, or through a measure summarily dismantling the institution? If the means employed by Nothaus and the Liberty Dollar movement were not criminal -- and there is nothing in the indictment demonstrating that they were -- then the objective must be the real focus of the prosecution. That's why I suspect there are contingency plans to devise additional spurious prosecutions of anybody who embodies any potential danger to the Federal Reserve System's continued existence. The thirteen-page federal grand jury indictment of Nothaus and his associates is densely cluttered with legal sophisms. Its treatment of the alleged acts of those involved in the NORFED/Liberty Dollar organization fall hopelessly short of describing the elements of a crime. There is no mention of a victim, or an injury to anyone. "Some purchasers [of Liberty Dollar coins] knowingly and willingly accept the Liberty Dollar currency as change. Other purchasers however [sic] do not know that have have been provided Liberty Dollar currency as change for a purchase because the Liberty Dollar currency appears to be official U.S. currency. Thus, in this instance, the unknowing customer has been provided coinage which cannot legally be used as U.S. currency, nor can it be deposited into the U.S. banking system because it is not U.S. currency." If there are "some" people anguished over receiving constitutionally legal currency -- such as silver coins -- as change for a purchase made in constitutionally spurious currency -- Federal Reserve Notes or officially minted pig-metal slugs, or legally negotiable instruments denominated in the same -- why isn't at least one of them mentioned here as a plaintiff in a criminal fraud prosecution? One suspects that the Feds either were unable to find someone suitably distressed to find real money in his change, or that they didn't even bother to look for someone of that description. Paragraph 28 of the indictment mentions a statement issued by the United States Mint, one of the Federal Reserve System's key partners in crime, "warning ... American citizens that the Liberty Dollar was `not legal tender.'" This is true. It is also irrelevant. The Liberty Dollar was never advertised as legal tender -- meaning a form of state-issued currency that people are required by "law" to accept. It was circulated on the principles of barter, used only where both parties to a transaction would be satisfied. Generally, people were delighted to receive real money in payment for a sale rather than the Regime's dull and useless counterfeit, and where merchants weren't interested in the Liberty Dollar, none was forced upon them. "Legal tender" laws testify to the fraudulent nature of an official currency, since the state forces people to accept it. The Liberty Dollar -- which, unlike the Regime's ersatz issuance, had innate value -- required no such compulsion in order to win acceptance. "Article I, section 8, clause 5 of the United States Constitution delegates to Congress the power to coin Money and to regulate the value thereof. This power was delegated to Congress in order to establish and preserve a uniform standard of value. Along with the power to coin money, Congress has the concurrent power to restrain the circulation of money which is not issued under its own authority in order to protect and preserve the constitutional currency for the benefit of the nation. Thus, it is a violation of the law for private coin systems to compete with the official coinage of the United States." Even though he's too dishonest to acknowledge it (and, most likely, too dim-witted to understand), Ryan has done something ironically worthwhile: Apart from his unwarranted assertion that Congress has the authority to "restrain" the circulation of money (since it's not mentioned by the Constitution, that power doesn't exist), Ryan has drawn up an article of indictment that applies perfectly to the Federal Reserve System, a private entity issuing a spurious, unconstitutional currency that has all but destroyed the value of the dollar. "In accordance with the U.S. Constitution, Federal Reserve Notes (FRNs), obligations, and securities of the United States which are issued by the U.S. Bureau of Engraving and Printing, and coins which are issued by the U.S. Mint, are the current money of the United States." Had Ryan amputated the first six words from that statement, it would have been true, in a positivist sense. By invoking the authority of the Constitution, however, those words become patently false. Nothing in the Constitution authorizes Congress to alienate its power to coin money from gold and silver into the hands of a private cartel that issues its own spurious "money." Additionally, note how the indictment descibes FRNs together with federally issued "obligations" and "securities" as "money." Apart from the fact that all of these instruments are issued by the government's Bureau of Engraving and Printing, what do they have in common? The answer, which I will not phrase in the form of a question, is this: All of these forms of money are instruments of debt, rather than instruments of value. They are, in a word, I.O.U.s -- pieces of paper promising that money will someday be paid. This means that they cannot be considered money themselves, no matter how loudly our rulers insist that they must. A curious artifact of a different time: A Treasury Bill redeemable in real money -- precious metal (click to enlarge). Yet the indictment describes the production and circulation of gold and silver coins as "counterfeiting." This makes as much sense as treating any form of mutually beneficial barter as criminal "fraud." I'm also left to wonder just how far the Feds are willing to go in pursuing the premises of this prosecution: If it's a "crime" to offer and accept privately minted silver coins in private transactions, would it be a "crime" for a merchant to accept only pre-1965 U.S. coins, which were ninety percent silver in composition? I don't see how the former could be considered criminal, without the latter also being treated as such. But then, of course, I strive to be honest and logical. Which means that I'm not good enough for government "work." Unlike, for example, Edward R. Ryan. The foundation of the indictment is composed of sedimentary layers of inconsequential detail supporting not a single overt criminal act. It is a comprehensive description of a premeditated plot to provide something of value -- gold and silver -- to people who wanted it. In defense of a criminal clique engaged in stealing what remains of our property and earnings, Ryan and his minions are trying to imprison at least four Liberty Dollar associates. They also seek to seize through "civil forfeiture" -- that is, to steal -- all of the company's assets, wherever they are found -- including, one presumes, from customers who bought gold, silver, platinum, and copper coins from the company. Which means, I suppose, that in the most vulgar sense, It's (All About) The Money, after all. My new radio program, Pro Libertate Radio, can be heard from 6:00-7:00 PM Central Time on the Liberty Radio News Network. Our toll-free number to take part in the program is 1-866-986-6397 (NEWS). If you're not blessed to live within the broadcast area of a network affiliate -- a small, but stalwart and growing list -- the program is available on-line. Another well-written and thoughtful stab at the heart of the matter, sir. I enjoy the hell out of this blog. Almost as much as I'm angered by the things that move you to write it. I've been following the Liberty Dollar debacle with disgust for some time and take heart that there are blogs like this out there. "Ryan has drawn up an article of indictment that applies perfectly to the Federal Reserve System, a private entity issuing a spurious, unconstitutional currency that has all but destroyed the value of the dollar." Precisely! I can only hope this is used in such a manner and that enough of this crap is enough and people WAKE UP to the crimes being committed in plain sight by the collectivist-oligarchists and their fiat empire. how come none of those notes said redeemable in silver or gold "coin"?....but just "coin"? usually a note said as much. NORFED's Liberty Dollar had its scheme, too. You had to pay Federal reserve notes to get them. How is the Liberty Dollar "inflation-proof" when its purchase is pegged, in one form or another, to the dollar? they are denominated in Federal Reserve Notes, and they simply jack the price to keep up with inflation. When silver was at $12, Bernard Von Nothaus, "monetary architect," was selling an ounce of silver for $20, which is perfectly moral to do, because it was entirely voluntary. People were buying an idea. A bad idea. Then Von Nothaus suddenly changed the "negotiable dollar value" of his stamped ounce of silver fifty dollars up front, non-negotiable. This "monetary architect" built his foundation on sand. Before the Federales stole all his assets, and while he was still minting his "non-money" rounds, Von Nothaus wheedled that he could no longer honor his paper slips, because the Federales had taken all the records. Surely he could recognize a NORFED note? Apparently not. So he kept selling his overpriced ounces of silver to people while stiffing the people who demanded the hard stuff. Slick. While I certainly don't approve of what the Federales did, my eyes are really quite dry when I think about Von Nothaus.
" the only substances recognized by the Constitution (Article I, section 10) as a legal currency -- gold and silver." Mr. Grigg, I respectfully beg to differ. That section merely forbids the states from recognizing anything besides gold and silver as legal tender. That simply means the states cannot force its citizens to accept a bushel of corn or a pint of whiskey in payment for a good or service rendered. This fact does not mean that the Federal Government couldn't produce slugs. Not by a far cry. It does not say, in Article 1, Section 8, that the Federal Government must only mint coins of silver or gold. In 1793, there were already copper coins being minted. The Federales can, with the blessings of the almighty Constitution, coin "money" out of lead or aluminum, if they so deign. The widespread myth that the Constitution mandated that Federal coins be made of gold or silver is something that is a pet peeve of mine. rick, my understanding is that "coin" historically has meant precious metal, usually silver. You raise an interesting and significant point, and given government's agility at exploiting ambiguities the lack of specificity here is probably significant. San Authoritas, my view of the Liberty Dollar has always been caveat emptor, largely because I thought their premiums were unreasonable. The fact that they were still taking FRNs is ironic, but of limited significance, I think, since all precious metals dealers I know take them, too. The same is true of incorrigible anti-government blatherskites such as myself, although I'd be happy to conduct business in silver coin or barter where I can. 1) The Constitution is not an airtight document; it is perforated with with tragic concessions through which one can fit all kinds of mischievous policies. The language to which you refer could be an example. 2)Commendable as it is that the Framers wrote a document intended to limit what they could do in power, they promptly proceeded to ignore many of its provisions as soon as they were installed in office. The same government that, in the 1790s, established that a "dollar" corresponded to a certain quantum of silver* also debased the currency by minting coins of ignoble metal. Was this an example of problem 1) or problem 2)? I'm not sure. But I am grateful to you for illuminating this matter and spurring my interest in studying it further. Thanks! *Hey, could this work as the title of the next Bond film? I think the main problem was simply the existence of the coercive State itself. But I, like you, no doubt, am biased. I have this thing called a "love of freedom." "Quantum of Silver." I can see it now. James Bond renounces the Queen and State, and goes freelance, fighting against Dr. DeBasemente, the evil mastermind of Central Bank, Inc. Using a Honda Civic, our hero escapes his enemies, racing down the highway at 85 MPH while one by one, their Government Motors vehicles fall apart as they drive. Later on, when he's in a tight spot at the hands of DeBasemente, he is rescued by the alluring, glittering Mademoiselle Specie. It would be an action-packed thrill ride, culminating in an epic battle scene in which the villain is crushed when his house, literally built out of debt certificates, collapses under its own weight. His last, screeching words would be, "It wasn't enough! Hahaha! We'll succeed next time! Next tiiiime!" This essay is the kind of thing that gets you sent to the gulag (if they were able to take you alive, of course). Thanks for another good one. Obviously, the Fed is deathly afraid of competition. One of the finest, hard hitting, under paid, under appreciated, journalists/writers out there. When the day dawns where Truth becomes valued- you will be rewarded in spades! It is my long standing belief that with ALL things gov't - follow the money if you want to find the truth. From the drug war, wars of aggression, the war on Father's, to you local speed trap . . . there are a gaggle of tax trough parasites making making good money off of it. How funny, and yet unsurprising, that the biggest mafia organization on the planet should wish to crush its competition! LOL! I'm find the Constitution is quite a piece of funny business. One shining example is that as soon as the shooting stopped they, the "founders" that is, made it illegal to do the very thing they just finished doing. Hmmmm.... How interesting. How does one really define "treason" when the ones defining the that term have just finished doing as much in the eyes of their brethren? I guess it's true what they say about history, and the bogus "laws" afterwards to justify their actions, being written by the victorious. As long-time supporters of NORFED and it's efforts to educate Individual Sovereign Human Beings across the entire globe, we thank you for this article. If only you and your fellow militia-men had been defending the stores of silver and gold at the Idaho vault, the gunvernment thugsters wouldn't have stolen it so easily. Hopefully they won't take your defensive armaments in the same manner! Surely, when the tipping point has been reached, the Sons and Daughters of Liberty will refuse, repel, and destroy the mobocracy looter minions. As Dave said, the FED is afraid of competition. Now they're putting themselves in a bind. Either they're going to make an example of this competition (they hope), or they're opening a can-O-worms. If the defense plays this right, MONEY itself will end up being on trial! My guess is that it'll be dropped if it heads down that road. Thanks Will, I sure enjoy your blog. Ignorantia juris non excusat! For crying out loud William! As a longtime reader (TNA) & admirer, it is unsettling to discover that you have apparently missed the boat on this Matter. Two wrongs do not equal right. Von Nothaus was perfectly within his rights to mint as many one troy ounce silver "rounds" as he might wish. However, he violated the Law (18 USC 486) the instant he decided to impress upon same a "dollar" value, and using that insignia / mark for same. (i.e. "$") Anyone wise enough to adhere to our Creator's Law/s (Leviticus 19:36; Deuteronomy 25:15-16) will also discover WHY 12 USC 411 and 26 USC 165(g)(2)(C) makes it even more advantageous to REDEEM the (Ph)ederal Reserve's Commercial Paper (which no longer meet all of the legal requirements to qualify as "Notes") for "Lawful Money" i.e. U.S. gold or silver Coin, through the U.S. Treasury via the U.S. Mint. I pulled this from the coinage act of 1792: kinda long but pertinent. "Sec. 9. And be it further enacted, That there shall be from time to time struck and coined at the said mint, coins of gold, silver, and copper, of the following denominations, values and descriptions, viz. Eagles–each to be of the value of ten dollars or units, and to contain two hundred and forty-seven grains and four eighths of a grain of pure, or two hundred and seventy grains of standard gold. Half Eagles–each to be of the value of five dollars, and to contain one hundred and twenty-three grains and six eighths of a grain of pure, or one hundred and thirty-five grains of standard gold. Quarter Eagles–each to be of the value of two dollars and a half dollar, and to contain sixty-one grains and seven eighths of a grain of pure, or sixty-seven grains and four eighths of a grain of standard gold. Dollars or Units–each to be of the value of a Spanish milled dollar as the same is now current, and to contain three hundred and seventy-one grains and four sixteenth parts of a grain of pure, or four hundred and sixteen grains of standard silver. Half Dollars–each to be of half the value of the dollar or unit, and to contain one hundred and eighty-five grains and ten sixteenth parts of a grain of pure, or two hundred and eight grains of standard silver. Quarter Dollars–each to be of one fourth the value of the dollar or unit, and to contain ninety-two grains and thirteen sixteenth parts of a grain of pure, or one hundred and four grains of standard silver. Dimes–each to be of the value of one tenth of a dollar or unit, and to contain thirty-seven grains and two sixteenth parts of a grain of pure, or forty-one grains and three fifth parts of a grain of standard silver. Half Dimes–each to be of the value of one twentieth of a dollar, and to contain eighteen grains and nine sixteenth parts of a grain of pure, or twenty grains and four fifth parts of a grain of standard silver. Cents–each to be of the value of the one hundredth part of a dollar, and to contain eleven penny-weights of copper. Half Cents–each to be of the value of half a cent, and to contain five penny-weights and half a penny-weight of copper." so they did start off using copper as well. however, all "cents" were to be copper, everything else was to be a precious metal. but this goes back to what SA said, there is no limit to what the feds can coin, but the states can only accept their gold and silver coins. will, this goes in line with what you were saying about there being holes throughout the constitution. on the same note, nowhere does it say that congress can print money. so in effect, this kinda forces them to use precious metals since base metals would not have enough value. "I smell a rat." and then refused to sign it. but this leads me to this question, who ever had the sensory perception strong enough to smell a rat?! i mean, what does a rat smell like? "If there are "some" people anguished over receiving constitutionally legal currency -- such as silver coins -- as change for a purchase made in constitutionally spurious currency -- Federal Reserve Notes or officially minted pig-metal slugs, or legally negotiable instruments denominated in the same -- why isn't at least one of them mentioned here as a plaintiff in a criminal fraud prosecution?" Is there any evidence that anyone ever even attempted to insist that someone else accept the Liberty Coins as payment for a debt, public or private? In other words, is there any evidence that anyone was even fooled into believing that these were US currency (which, by definition, is good for all debts, public and private, i.e. MUST be accepted, under the law; all other forms need not be accepted, e.g. A might owe B $10 dollars per a contract; A might offer B, instead of $10 dollars; $10 worth of eggs in settlement of the debt; B NEED not accept it but might insist on $10 US currency). "NORFED's Liberty Dollar had its scheme, too. You had to pay Federal reserve notes to get them." That's actually a rather disengenuous statement and also not completely true. Aside from the fact that I wouldn't know what other medium they would accept because the Fed has an almost complete monopoly on this aspect of trade, I want to make it clear that I traded silver bars to get liberty's and I was then just charged the mint fee, and I was able to pay the minting fee in LIBERTY DOLLARS as WELL. So the Liberty Dollar folks were VERY accomodative whenever possible to accept something other than green pieces of paper. Additionally something Sans said, which was not correct is that when silver was $12 Liberty charged $20, he obviously did not understand the program. I, being a merchant was able to buy Liberty's at approx $14.00 when silver was $12. 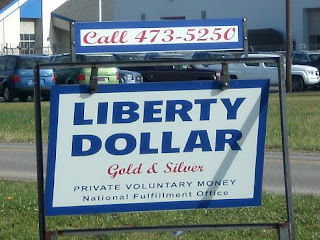 So Liberty Dollar was certainly not making any killing on silver, and this option was available to ANYBODY who was a merchant, associate or Regional Currency Office. So, sorry, but I fail to see any "scheme" there except covering ones cost to produce a product. It was the end user, who spent the Liberty who benefited most, and the merchant who chose to give it out as change. And how does changing the face value to $50 make it non-negotiable ? I still take them to this day and people negotiate with me all the time, it is still an ounce of silver, it just said $50 on it when silver hit $21.00 dollars. Do you not take Eagle's because they say $1.00 on them ?? The whole Liberty Dollar system is actually quite a sophisticated system, which only someone who studied all aspects of it would understand. It being a private currency which bridged the gap between the failing FRN and a commodity currency and it fills this purpose extremely well. You are able to send your old 10, or 20 face value peices in to be reminted once silver again hits $20 dollars. Sorry but that is ingenious, and is most certainly inflation proof. You need to study it a bit better before you go off criticizing something that has been working in our towns here since 1999. So it is probably actually ahead of its time and will only be sought after a dollar drop of magnitude, and it is more sophisticated than some are able to understand at first. Also the term "legal tender" is possibly not completely understood by Sans Authoritas because, myself, as a merchant, am absolutly NOT required to accept legal tender for payment at my establishment for ANYTHING if I so desired. I can accept what I choose from corn to silver to gas. The term "legal tender" means "acceptable for payment of taxes", and thats it, it does not mean "all that is legal to tender", because Canadian Money would be illegal to use in the US, because it is not legal tender here, but I accept it all the time, and Credit Cards are certainly not legal tender, but I accept them. I support Bernard's effort 100% because he is someone out there DOING something effective as opposed to just being a think tank and complaining. There are only 2 court cases that currently carry any significance in this country, these are the Liberty Dollar case and Pete Hendrickson's fundamental law case.